75 Things We love about Westchester! There’s a lot to love about the 90045! With Westchester’s 75th anniversary kicking-off this month, we thought we’d reach out to the community to find out what they felt made Westchester so special. People emailed, commented on Facebook and told us in person what their favorite things were about this small town community tucked inside a big city. Whether it was something trivial like a favorite restaurant, or something profound like neighbors being dedicated to helping each other, one thing was clear when we compiled the responses: Westchester holds a special place in the hearts of anyone who spends any amount of time here. The wonderfully active community groups and organizations! I marvel at the number of volunteer-based organizations in Westchester that serve to improve the community through their great work. We are so lucky to have the best neighbors anyone could ever dream of! Everyone looks out for each other and is eager to lend a helping hand. Thank you Westchester! Everything is within walking distance! The Humble Potato and its Battle Royale burger. One of the things that I love about Westchester is the interconnectedness and collaboration between the various community organizations and businesses in support of one another. This is a great example of how working together ensures a strong community! 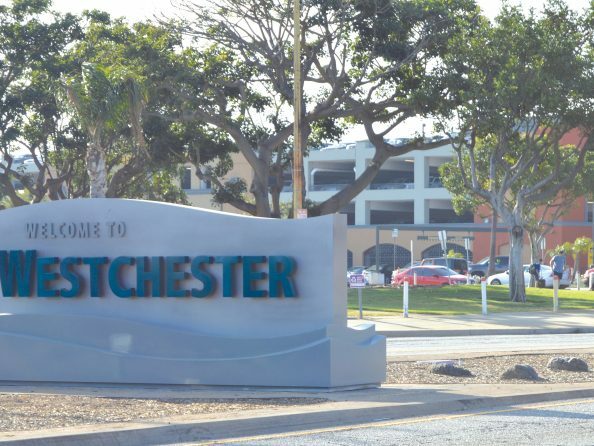 Westchester is where my parents built a home when I was born. The streets were not paved and no other houses were in close proximity. I grew up and moved on, coming back to Westchester when my father passed away at a very young age. I bought my parents’ home and my mother bought the house next door. We took the wall down between the two houses. I raised both of my sons in the same house I grew up in, with easy access and an open yard to their grandmother’s home next door. I now live in the house next door, with so many, many wonderful memories of family and friends who shared many joyful times together in my two homes in Westchester. The Fourth of July parade! Best little hometown close to the water. The diversity of its people. Compared to other parts of LA, I love the convenience of being able to park for free at most of our shopping complexes. The cool ocean breeze. I work east of the 405 and north of the 10 and it can be up to 20 degrees hotter and muggier. I love pulling up at home and having the ocean air. Baseball, softball and tee-ball at Nielsen Park. Musical Beginnings–providing the gift of music from toddlerhood through high school. The Westchester Lariats the only non-profit folk/international dance organization for kids in California! Created as an after-school square dance club in 1950 and still active today! Watching the planes from In-N-Out! Wonderful MOMS Club with activities and play dates. Running or walking along Westchester Parkway. The “You are Beautiful” mural in the Ralph’s parking lot. The Westchester skate park. It’s a great place to practice your skateboarding skills. Westchester Lutheran’s Fourth of July parade float! Otis College of Art and Design-make sure to visit one of its show in the Ben Maltz Gallery or the Senior Show in May. Although they can be loud, I love seeing the planes take off and land. Moms of Westchester and PDR! Beautiful sunsets from our front porch! Residents always working to better the community like Cyndi Hench, Eli T. Wagner and Heather Eli to just name a few. Covenant Preschool – a neighborhood gem. Del Rey Christian Preschool. We love it! The carnival that Visitation holds every other year. Being able to easily pick-up and drop-off family and friends at LAX. The Flight Path walk of fame along Sepulvda. Ayara Thai’s Pad Thai. When’s lunch? The Westchester Family YMCA’s pool. It’s where I learned to swim! We are so lucky to have a world-class university like LMU in our backyard. I love visiting the campus for events and basketball games. It’s long gone but I have great memories of the Antique Mall. Westchester Park…especially the swimming poll! The Westchester Farmers’ Market on Wednesdays. It’s a great place to meet your neighbors and pick up fresh produce. You can’t go anywhere in town without running into someone you know whether it’s going to Little Vons, Kohl’s or Starbuck’s. The old Loyola Theater building. The great view from the Westchester Bluffs. Coffee Co. for breakfast every weekend. If you have a question about something going on in the community, someone is sure to know the answer! My favorite thing about Westchester is that my children got to attend the same schools that I attended so many years ago: Kentwood, Wright Middle School and Westchester High School! I was able to continue my support of our local schools for the next generation. I have lived in Westchester since 1970, and my parents still live in the house I grew up in. Tower Pizza for beer and pizza! I love that our neighbors are now our friends and we can discuss neighborhood news with them. The LAX Coastal Chamber. Not only do we care about our members, but we also work to help make the community better with programs like the Teacher Eddy Awards and the Fourth of July Parade. I love all of the fun runs we have like the Jet to Jetty, Race for Success and the Tommy Scott Memorial Run. The Florentine cookies at Westchester Bakery. The Westchester Playhouse puts on some great plays and musicals. You can’t go wrong supporting that nonprofit. We love walking around Westchester, especially since the sidewalks on Sepulveda have been fixed. The bowling alley mosaic at the bowling alley brings back memories every time I see it. No matter where you are in Westchester, you’re always close to the beach, and hopefully, the ocean breeze. I love how pretty Westchester looks when all of the flowers and trees are blooming. I love that there are so many community groups working to help make the schools better for our kids. The Rotary Club of Westchester! There are a lot of social clubs and organizations to join. The Home Makeover Project that the Rotary Club does every other year to help improve the home of a community member. It’s a great place to raise a family. I grew up here, and a lot of my friends and family still live here. The people! There are some really great people in this town. We are lucky to have such a great police and fire department to keep Westchester safe. The Emerson Ave. Community Garden! We love visiting for story time and to see what’s growing. The sandwiches from Olive It! I love picking up my lunch from there. How passionate our community gets where there is a problem. Whether it’s working to fix the Senior Center or raising money for a worthy cause, we got your back! Although we’ve had a lot of changes over the years, Westchester still retains its close-knit community feel! How passionate our community gets when there is a problem. Whether it’s working to fix the Senior Center or raising money for a worthy cause, we got your back! Great Neighbors! Pride in our neighborhood. Community! That about sums it up. Westchester is truly an amazing community to live in and to work in.